Many people consider bilinguals to be exceptional, yet almost half the world’s population speaks more than one language. Bilingualism is found in every country of the world, in every class of society, in all age groups. Life with Two Languages is the first book to provide a complete and authoritative look at the nature of the bilingual experience. 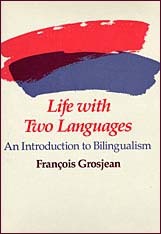 François Grosjean, himself a bilingual, covers the topic from each of its many angles in order to provide a balanced introduction to this fascinating phenomenon. Grosjean discusses the political and social situations that arise when languages come into contact and the policies nations have established toward their linguistic minorities in the domains of education and governance. Of particular interest is his detailed account of the psychological and social factors that lead a bilingual to choose one of her languages when speaking to another bilingual or to use both languages in the fascinating phenomenon of code-switching. The author explains how children become bilingual as quickly as they become monolingual, describes the organization of languages in the bilingual brain, and examines the legacy of bilingualism on language, as exemplified in word borrowings. Above all, Life with Two Languages puts the emphasis on the bilingual person. In a series of first-hand reports scattered throughout the book, bilinguals tell what it is like to live with two languages and describe the educational and social experiences they have undergone. Written in a clear and informative style, Life with Two Languages will appeal to professionals and students in linguistics, education, sociology, and psychology, as well as to the more casually curious.